At Spuds R Us, we take processed vegetable Quality Control very seriously, to the point of being obsessive. Food quality and food safety is our prime focus. Our large purpose built facility has segregated, temperature controlled rooms. Our tracking system enables us to trace products from farm to end user. 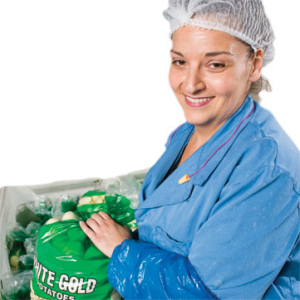 We buy our potatoes, onions and carrots from HACCP certified suppliers- and in most instances we source premium grade. Potatoes are seasonally available and therefore we source them across Australia to ensure we have supply all year round. Every quarter our testing is outsourced to laboratories to ensure that we are maintaining high standards. 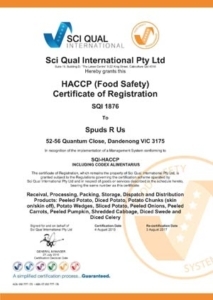 Our HACCP certification is updated every 12 months. procedures and systems, please don’t hesitate to contact us.